HCM City (VNA) – A perfect public-private partnership (PPP) model should harmonise the interests of State agencies, investors, beneficiaries and those affected by the project, an official of Ho Chi Minh City has said. Speaking at an international seminar in HCM City on March 27, Secretary of the municipal Party Committee Nguyen Thien Nhan took school and hospital projects as an example, saying as well as from students and patients, the projects musts pay attention to people affected by land clearance. The seminar was organised by the HCM City People’s Committee and the World Bank (WB) in Vietnam, aiming to seek strategies to increase investment under the PPP model in infrastructure, healthcare, education, solid waste and wastewater treatment, and fighting floods in the southern metropolis. 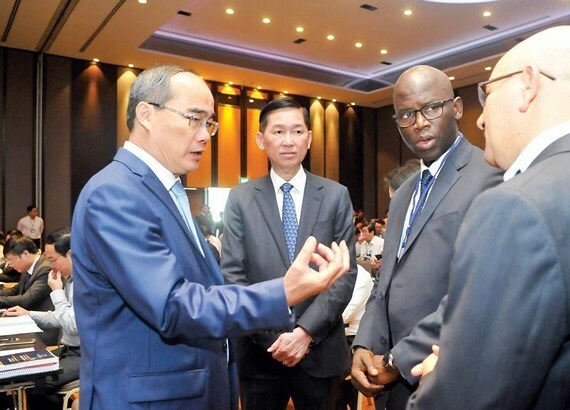 Ousmane Dione, WB Country Director for Vietnam, stressed the need to consider the PPP model a long-term cooperation one, under which the public and private sectors share benefits and risks. PPP must be a cooperation model that benefits all relevant sides, he said, noting that regulations must be clear, persuading investors to accept long-term risks. He said the WB will help Vietnam and HCM City in particular step up the implementation of PPP projects. Nguyen Dang Truong, head of the Public Procurement Agency under the Ministry of Planning and Investment, said a PPP law should be developed, ensuring simple, clear and effective implementation of PPP projects, as well as international practices. The law also needs to prescribe investment areas, capital for projects, the Government’s guarantee and the operation of businesses concerned, he said. Nguyen Thanh Phong, Chairman of the municipal People’s Committee, said PPP has been seen as an optimal solution to address capital shortages in infrastructure and services, especially in localities with huge investment demands like HCM City. The official pointed out the small number of PPP projects in HCM City that make up only 5 percent of the locality’s total public projects, along with challenges facing the projects. HCM City will consolidate the existing solutions and propose new, more efficient ones effort to attract investment, he said, adding the city hopes international organisations and businesses will put their confidence in local reform policies. The city is committed to creating the best possible conditions for investors who select it as a long-term investment destination, Phong said. Other delegates suggested HCM City invest in transport, healthcare, education and the environment to maintain its competitiveness and handle challenges caused by rapid urbanisation.